The bottom line is that over $53m has been raised to combat ALS: a horrible and, up to now, largely unknown disease. JP Morgan employees take the Ice Bucket Challenge. Rarely has something demonstrated the power of social media better than the #icebucketchallenge that has taken over Facebook timelines, Twitter, and YouTube in recent weeks. Everyone from Fortune 100 CEOs to celebrities to politicians to ordinary citizens have been doused in icy water to raise money for The ALS Association, a nonprofit that funds research to find treatments and a cure for amyotrophic lateral sclerosis, a condition more commonly known as Lou Gehrig’s Disease or, in Europe, motor neuron disease. 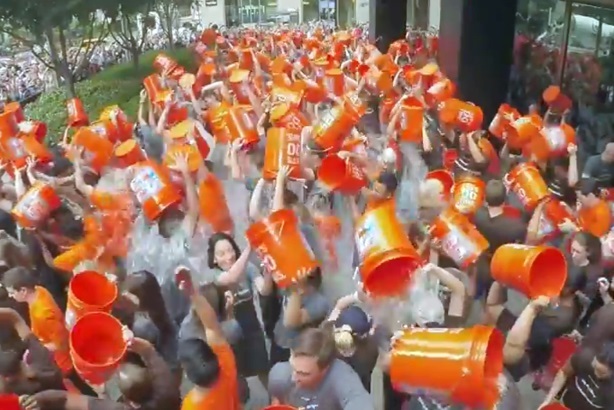 The nuts and bolts of the challenge start with individuals dousing themselves in water – or being doused - and donating some money to ALS, or missing out on the dousing and sending a larger amount, which is what President Obama chose to do. In doing the challenge, you assign others to go through the same process within 24 hours of being nominated, you pour ice water on yourself and film it, or donate $100 to ALS research - then you challenge friends to do the same. The association said Friday it had received $53.3 million in donations between July 29 and August 22, a staggering figure that is quickly heading for three times the $19.1 million it received in the complete year to the end of January 2013, and dwarfing the $2.2 million it collected in the same period last year. The association has attracted 1.1 million new donors. ALS is a progressive neurodegenerative disease that attacks nerve cells and pathways in the brain and spinal cord. When the cells die, voluntary muscle control and movement dies with them and patients in the later stages of the disease are totally paralyzed, although in most cases their minds remain sharp and alert. The association believes as many as 30,000 Americans may currently be affected by ALS, which is responsible for two deaths per 100,000 people. The average life expectancy of a person with ALS is two to five years from time of diagnosis. From a communications, social media strategy, and viral marketing point of view it’s a fascinating case study. The original idea had nothing to do with The ALS Association: it was started in July by a recently diagnosed ALS sufferer, 31-year-old Pat Quinn of Long Island, who nominated his fellow ALS patient and former Boston College athlete Pete Frates, someone who has been working to build awareness about the disease since his diagnosis over two years ago. Frates has a large network of followers that engaged with the #icebucketchallenge and it took on a life of its own from there, proving the amazing virality and organic growth potential of social media. As much as it is happy about the amount of money being donated to the ALS cause, the association is just as thrilled by the rise in awareness about a disease that was either not known about or misunderstood previously. Its small team has cleverly ridden the massive wave of publicity in the phenomenon, setting up relevant hashtags – #icebucketchallenge, #alsicebucketchallenge, and #strikeoutals – and providing daily updates of money raised and social media collateral, without being seen to "cash in" on it. One unexpected challenge now for the organization will be deciding how to distribute the money most effectively, and, as importantly, how to be seen to be doing so. And the people at ALS will also be hoping that this doesn’t become a one-hit wonder that dissipates to nothing once the next social media phenomenon arrives on the scene. Because the disease affects a relatively small amount of people compared to other medical conditions it doesn’t receive as much attention from drug companies as it could, and the association will be hoping this changes following the spike in attention around it. The whole #icebucketchallenge phenomenon has also raised various issues for brands, corporations, CEOs, politicians, sports stars, celebrities, and even journalists in the way they handle their involvement in it, if indeed they decide to get involved. Former President George W. Bush took the challenge and his dousing came with a plot twist supplied by wife Laura, although some said he was risking comparison with the waterboarding torture methods used in Guantanamo Bay on his watch. Actor Charlie Sheen’s twist on the challenge involved emphasizing that this was all about donating money to the nonprofit, not celebrities bigging up themselves, as he poured dollar bills over himself rather than water. And we had the unlikely spectacle of Steve-O from Jackass acting as moral arbiter and prompting the awkward question of whether celebrities’ involvement in the challenge was really raising any awareness at all. Brands including Coca-Cola, Target, McDonald’s, General Mills, Allstate, Mondelez, Starbucks, and KFC all got involved, usually not missing the opportunity to promote their brand(s) along the way. Companies such as JP Morgan did a mass challenge and donated $150,000 to the cause. And I guess that’s the bottom line: if it’s raising money and awareness in the pursuit of a cure or better treatment for a terrible disease, on balance it has to be a good thing. Other companies attacked the ALS issue in their own inimitable way. Combative T-Mobile CEO John Legere took the challenge last week and in turn nominated fellow telecoms CEOs Lowell McAdam from Verizon, Marcelo Claure from Sprint, and AT&T’s Randall Stephenson. It placed them in an interesting spot from a reputation point of view: should they ignore their feisty challenger, take the high ground and just donate money, or act as "good sports" and take a dousing? AT&T Mobility CEO Ralph de la Vega did take the challenge, but he was very careful to say it was in response to being nominated by AT&T’s director of executive communications Clay Owen, and he certainly didn’t reference the challenge from Legere. Sprint’s Claure took the challenge, again without directly referencing Legere, and announced a donation of $200,000 to ALS – giving back "in a big way… not like our competitors who only gave $100,000." "We’re gonna double what they did, because we double whatever they do," added Claure. All very internecine in a brutally competitive industry, but all ultimately benefiting the ALS cause. I may have missed it, but PR agencies have been strangely reticent to get involved in the #icebucketchallenge, at least as far as I am aware. Either that or they have been doing it very quietly and not seeking self-publicity. It has mostly been individuals getting involved, such as Spong CEO Doug Spong, rather than concerted efforts on behalf of the firms. Maybe that’s because most agencies already have strong relationships with nonprofits, both as clients and pro bono partners, and don’t want to upset them by publicly raising money and awareness for other causes. Anyway, PRWeek is happy to provide a forum on our website or Tumblr blog for any agencies that have already, or are going to do, the challenge. And I welcome any comments or thoughts on the challenge in terms of its lessons for brand and agency communicators and social media experts. Right, I have just been nominated to take the #icebucketchallenge by PRWeek’s web editor Brittaney Kiefer – thks so much Brittaney… - and I’m off to get doused in freezing cold water myself. You will no doubt see the results here soon - all in aid of a very good cause.